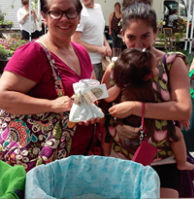 Echotopia® is Baltimore's garden-based, zero-waste and biodiversity building cleaning products business. 1. Prevented over 2,000 items of trash through refills/sales. Refill sign photos are HERE. 2. Cleaned and protected Mid-Atlantic waterways through repeated use of our biodegradable cleaners. 3. Promoted pollinator gardens and building biodiversity. We have saved, then sold, tens of thousands of native wildflower seeds embedded in about 300 plantable Echotopia Seed Rounds. 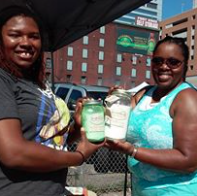 With a refill station stall at Baltimore weekend farmers markets, we sell laundry detergent, kitchen/bath cleaners, and hand scrub powder. Our child-friendly products get the job done. We use home grown medicinal herbs, essential oils, sustainably mined U.S.-sourced minerals, and local vegan castile soap. We offer re-use packaging & plastic-free or compostable accessories. Our products are fragrant, concentrated and safe. We sell plantable paper discs, Echotopia Seed Rounds, with embedded native perennial seeds. The wildflowers that germinate support pollinators, promoting restoration. We engage in reciprocity with nature’s systems. Echotopia prioritizes fair trade and regional business partners. Echotopia® has an immediate positive impact on the environment and on the local living economy. Echotopia LLC is based in Baltimore, MD, USofA. 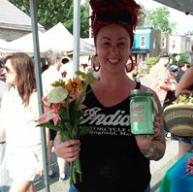 Visit Facebook HERE for our current market schedule in Baltimore, Maryland. For our story, see our 2015 fundraising video HERE. Echotopia® cleaning products are highly concentrated and longlasting. Laundry Powder: Lavender, Sage & Rosemary or Chamomile Rose. Works in all washing machines, top loading and HE side loading. Put directly in the drum..
All-purpose Scouring Scrub: Lemon Thyme or Orange Oregano. For kitchen and bath surfaces such as sinks, stove tops, tile and grout, countertops, tubs, and even dishes washed by hand. Degreaser and multi-purpose surface cleaner. Hand Scrub: Hint of Mint or Tea Tree Tarragon. Exfoliating and moisturizing hand cleaner. Removes tough odors and stubborn stains, even from cuticles and nails. Ideal for cooks, farmers, gardeners, bike and car mechanics, painters, cobblers, jewelry makers, crafters, print makers, ceramic artists, fisherpeople. 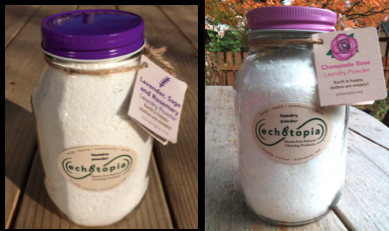 Echotopia® waste-free natural cleaning products are aromatherapeutic and are locally manufactured by hand in small batches. 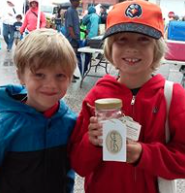 They are sold at Baltimore farmers' markets and area shops. At markets, customers can 1) bring their own containers, 2) use our upcycled containers when in stock, 3) buy Echotopia® re-use glass jars or canvas bags, 4) then return for refills, paying only for the powders..
Echotopia® implements cleaner, greener practices, reducing public and environmental health costs of body and household cleaning. Our work space uses over 50% LESS electricity than the average U.S. home. In 2019, we transition to using 80% local community solar power using Neighborhood Sun (learn more HERE) and 20% wind power. We also use salvaged, compostable or recyclable materials at every opportunity, including our manufacturing process and shipping. We are close to our goal of petroleum and plastic-free ingredients and packaging. Echotopia® products and accessories don't contain nasty chemicals that harm our precious waterways. Our reuse containers do not become permanent or dangerous toxic waste destined for landfill, incinerators, or fragile natural settings like parks, trees, and rivers. Echotopia® will implement non-fossil fuel transportation at our earliest opportunity. Echotopia® partners with our customers in ecosystem restoration, to create local wildflower habitats through another unique product, Echotopia® Seed Rounds: homemade 3" old paper discs embedded with native flower seeds. In our first three years of business, our customers purchased hundreds of Seed Rounds designed to encourage multiplying wildlife gardens that feed embattled bees, birds, butterflies and others in our shared food chain. Together, we protect and regenerate natural systems in the Chesapeake Bay watershed. Together, we can clean it up. Echotopia® is a social enterprise for every one. Like a melodic and soothing echo, Echotopia® is music to our ears. Soothing, calming scent. Works in all washing machines. Concentrated. Contains 2 lbs.total. Using one T. average per load, you will get about ninety loads from this jar. Ingredients: garden herbs, essential oils, 100% natural cleaners and locally-made, biodegrdable soap flakes. Made by hand. No dangerous chemicals, optical brighteners, phosphates or fragrances. Safe for people, waterways and nature. Fresh, enlivening smell, eliminates stubborn stains, dirt, grime, and odors. Is both exfoliating and moisturizing. Use after fishing, gardening, cooking, painting, mechanics, ceramics, crafting and more. Made with garden herbs, essential oils and locally manufactured, all-natural olive oil castile soap and 100% natural mineral ingredients. Very concentrated, up to four month supply. Hole in lid for easy sprinkling onto hand. Delightful clean aroma, with powerful and healthful disinfectant properties. Made with local garden herbs, essential oils and 100% natural, biodegradable ingredients. Excellent for kitchen & bath surfaces such as sinks, stove tops, tile and grout. Concentrated. Up to 2 month supply. Safe for people, waterways and nature. Homemade artisan 3" discs designed to create mini wildflower gardens that feed local pollinators such as bees, moths, butterflies, and birds. They have a comforting, woodsy scent from drying in the sun, and are hand-made with old paper & native wildflower seeds saved from local gardens: Black-eyed Susans, Purple Coneflowers, Bee Balm, Butterfly Weed, Common Milkweek, Aster, Goldenrod seeds and more! 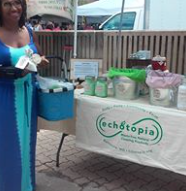 Echotopia® products are sold in Baltimore, MD. See Facebook / Twitter for updates. 2019 schedule: For online/special order questions, contact: diane@echotopia.org. SUNDAYS a.m. April 7, May 5 & 19, June 2, 16 & 30, July 14 & 28, Sept 15 & 29, Oct 13 & 27, Nov 10 & 24, Dec 8, 15, 21. PLEASE visit the top of our FACEBOOK page for updates or changes. Native perennials: Black-eyed Susan, Echinacea (or Purple Cone Flower), Butterfly Weed, Joe Pie Weed, Common Milkweed, Swamp Milkweed, Aster, Goldenrod, Bee Balm (purple and red). Other flowers: Giant Marigold, Giant Zinnea, Evening Primrose (biennial), Lobelia, Purple/Red Clover. Mission: To build a fair, resilient and abundant local living economy for all in the Chesapeake region. Vision: A just and regenerative society that engages in reciprocity with nature’s enchanting systems, since we are all in this together.